This area includes Mount Macedon, Hanging Rock, Malmsbury, Bacchus Marsh, Kyneton, Daylesford, Hepburn Springs and Kilmore. Frederic McCubbin's famous painting, The Pioneer (see right), was painted at Mount Macedon and the growing city of Melbourne can be faintly made out in the background. The painting hangs in the Ian Potter Centre in Melbourne. 10am to 4pm, Saturdays & Sundays .. 29 Goldies Lane, Woodend , VIC ..
A large garden covering over 7 hectares. It reopens to the public on 8th September 2012. Entry charges apply. 10am to 4pm, Saturdays & Sundays .. 751 Mt. Macedon Rd, Mt. Macedon, VIC .. The Woodend Winter Arts Festival showcases music, literature and the visual arts in intimate historical venues over three pleasurable days. ..
.. 8th to 10th June 2018 (tbc) .. 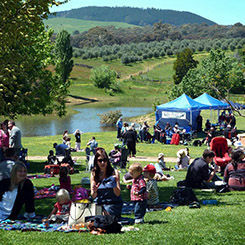 The Kyneton Music Festival features bands and food trucks in the historic town of Kyneton. You can either take the V-Line train or enjoy a pleasant drive. Either way it is about an hour from central Melbourne with numbers of affordable places to stay. Ticket prices and bookings at the Festival website. The traditional New Years Day races at the atmospheric racecourse at Hanging Rock. ..
An occasional craft market held in the beautiful suooundings of Hanging Rock. An entry fee applies ..
10am to 3pm, 31 Oct 2010 & 13March 2011 .. Hanging Rock, South Rock Road, Woodend ..
8am-1pm, 2nd Saturday of month .. St Paul's Park, Piper Street,, ..